Join us on the last day of the ECM31, Monday 27 August, for the favorite excursion of all: the Lakes of Covadonga in the Picos de Europa National Park. We will depart from Oviedo to Cangas de Onís, one of the main gateways to the Picos de Europa mountains. 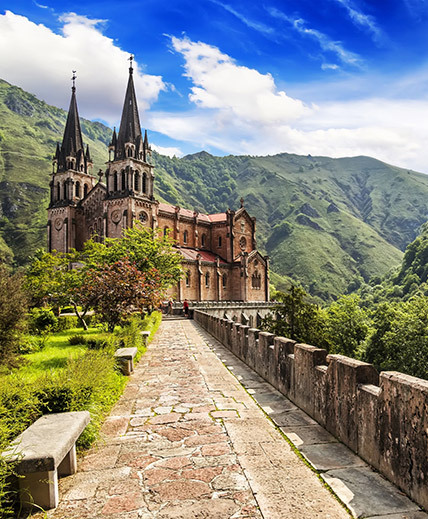 Once in the Picos de Europa mountains we will arrive in Covadonga with its Neo-Romanesque basilica. Afterwards we will enjoy a splendid, mountainous scenic drive to the Covadonga lakes, where we will have some time for lunch (a lunch box is included in the booking) and walk. On the way back to Oviedo, we will visit Ribadesella, a traditional and charming fishing village. Tickets for the excursion can be booked in the ECM31 User Area.